I've been teaching my students about being good stewards of the resources God has given us. Part of this was learning about alternative power sources. 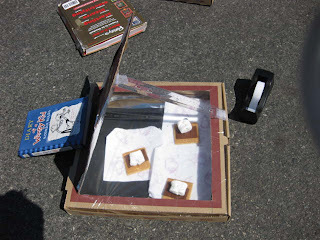 This week we took advantage of some solar power to make solar ovens. It's a simple project, where all you need is a pizza box, some tin foil, black paper, and laminate. We made s'mores in ours, but I've heard you can even make cookies! Try it out! Now that is a crafty project! great idea--my kiddos would love it and I wouldn't have to worry about fire and their safety. thanks for sharing. Mmmm. mmm. mmm. Who needs the old bean pot when you can have Smores! Maybe I will clean with Mary and then treat myself to some solar Smores when I am done. Can't have a s'more oven without Diary of a Wimpy Kid, of course!